As we approach the third decade of the 21st century, the stark disparities prevalent between men and women in the workplace have been thrust glaringly into the spotlight. This oppressing inequality has become undeniably apparent on a multitude of levels—a grievous fault in our modern society begging for relief. All too often it seems debate on this subject is focused on its possible causes rather than a proactive approach toward a remedy. 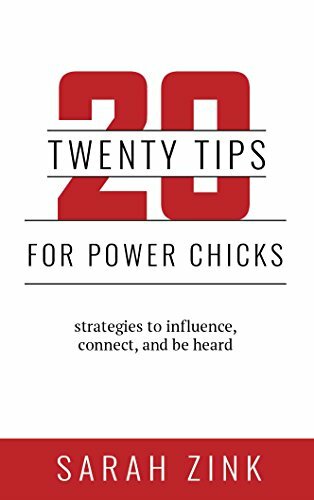 Sarah Zink's 20 Tips for Power Chicks: Strategies to Influence, Connect, and Be Heard defies that unproductive norm, however, by immediately putting the tools for change in the hands of women, thereby setting the tone for her point-by-point approach to helping women empower themselves. 20 Tips for Power Chicks provides strategic methods for women to make the most out of situational encounters and everyday challenges in the workplace. In doing so, Zink displays a masterful understanding of the differences between the feminine and masculine characteristics that influence perspectives and attitudes—personal attributes that have an intrinsic bearing on success. Presented in a practical and concise format, 20 Tips for Power Chicks is filled with easily applied information and strategies that go well beyond the twenty tips promised in the title, in and of themselves a trove of assets for any woman intent on success in an often sexist world. Reading like a how-to manual for the do-it-yourselfer, issues addressed include personal accountability in communication, behavior, and time management. Power tactics are also presented which revolve around two maxims presented by Zink: One, take control of your destiny or everyone else will and, two, it's never too late to become the person you might have been. Zink's background in education, psychology, and community development, as well as her extensive work with individuals, businesses, and governments provide her the experience to teach other women how to be assertive, tactful, mature, thorough, fearless, and committed in their quest for success. Her own success as a public speaker, author, radio show host, and businesswoman is proof that she knows what it takes to be a Power Chick. Christopher Zoukis is a staff writer for NY Journal of Books.